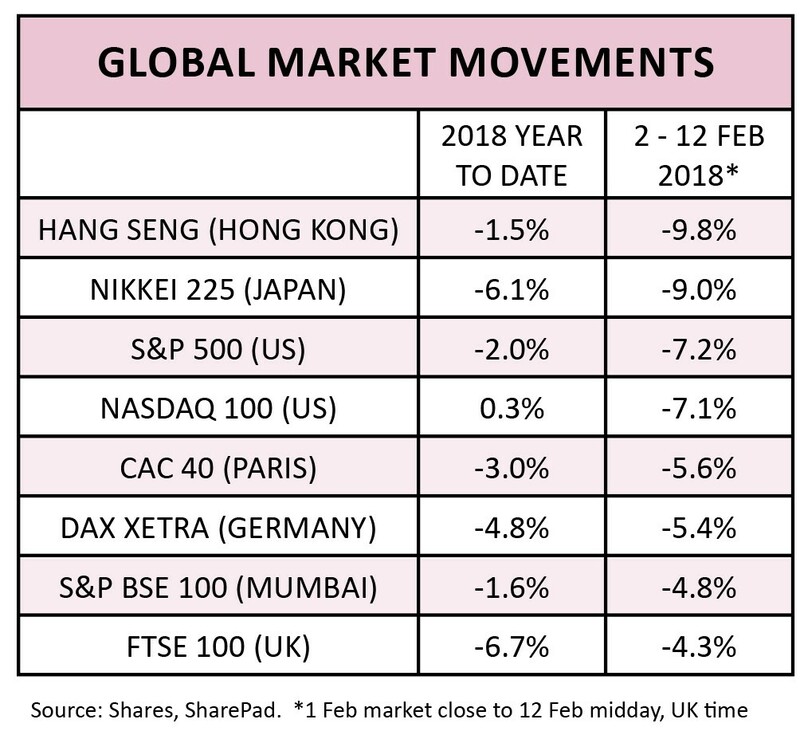 The global stock market sell-off that started in the US on 2 February could linger for a while, judging by the way markets have behaved since that event. There was a glimmer of hope on 7 February when the UK market, along with many other parts of the world, started to bounce back. Yet hopes have since been dashed as markets fell back into the red. The widespread decline in share prices has understandably made investors nervous and eager to find some way to add an element of protection to their portfolios. We’ll talk through some options in this article and explain why they may be relevant given the current market backdrop. Markets have fallen due to concerns about economic strength accelerating the pace at which interest rates are lifted. Economic strength can lead to higher wage growth and higher selling prices which fuels inflation. Higher interest rates push up borrowing costs for companies and individuals, potentially hurting corporate profits and curbing economic activity. Higher interest rates can also make stocks and shares less appealing versus other investment assets such as bonds. You may think we’re in a peculiar situation as surely higher economic activity is a positive sign? It is; yet you also have to consider that the market is waking up the fact that we’re now coming to the end of a long period of easy monetary policy from central banks. Fundamentally stocks and shares remain attractive over the long-term; you’ll simply need to become accustomed to more volatile market conditions. That may well see a flight to safety by a lot of investors. Many investment experts think that current market turbulence may prove to be a ‘potential opportunity to find value across a variety of assets’. So says Emiel van den Heiligenberg, head of asset allocation at Legal & General Asset Management. ‘From a fundamental standpoint little seems to have changed,’ echoes Steven Andrew, multi-asset fund manager at M&G Investments. ‘Our predisposition would be to add equity exposure,’ he says. WHAT SHOULD NERVOUS INVESTORS DO NOW? There are other options if you are too nervous to buy more shares. Gaining exposure to assets with typically lower correlation to stock markets is clearly one route. These assets might include gold, property, renewables or specialist capital preservation funds. We will examine these later in this feature. Other options might be specialist funds that invest in areas like private equity, life sciences, reinsurance or money markets. You could even take your money off the investment table entirely, although history suggests that could be a poor move. Why? Because ‘remaining invested in the market has historically been the best course of action if you’re a long-term investor,’ wrote Daniel Coatsworth, Shares editor, last week. ‘Stock markets have a tendency to recover faster than you think, although no one knows exactly when that recovery will happen,’ he added. Overall, we suggest nervous investors either sit tight and do nothing or consider rejigging your portfolio to have a greater weighting towards assets that are considered to have lower correlation to the markets. Read on to learn about a variety of different examples. Renewable funds arguably didn’t exist as a dedicated asset class five years ago yet they are now popular thanks to climate change concerns around fossil fuels. Concentrated mainly around solar, wind and water projects, since 2013 the UK renewables investment space has raised more than £2bn from investors and added approximately 3,516 MW (megawatts) of output to the UK power grid. Improved sentiment towards power prices helped maintain premium ratings through 2017 and despite intense competition for UK assets, share prices of renewable funds have held up remarkably well even through the teeth of stock market volatility. Presumably, this is because of the extended investment timeframes needed to get renewable energy projects off the ground, but crucially, because of widespread government backing including subsidy support. That insulates this niche investment space from many of the uncertainties that dog other parts of the investment universe. Since 2012, Britain has halved carbon emissions in the electricity sector making the power system the fourth cleanest in Europe and the seventh cleanest in the world. That’s led to growth in the number of renewables funds available to investors, many of which carry attractive and inflation-proof income yields. For example, Bluefield Solar Income Fund (BSIF) targets 7% income yield with the intention of raising dividends each year by the level of RPI inflation. Its share price has only eased back 1.5% since the start of the global market sell-off this year versus nearly 5% decline from the FTSE 100, for example. Greencoat UK Wind (UKW) and John Laing Environmental Assets (JLEN) are other relevant examples. The gold price is often touted as an asset that holds its value during times of strife – whether it is driven by politics, war or even stock market troubles. It is also seen as a hedge against inflation. one method of protection rather than as a source of substantial value generation. You may argue that cash also serves the same purpose, which would be a fair point. However, inflation eats in the real returns from cash and the theme of rising inflation is central to the latest global stock market sell-off. Gold is higher risk than cash as its price is unpredictable. You have the potential to make better returns than cash, but also the potential to lose money on gold as well. The World Gold Council calculates gold has grown by an average 10% in value annually since 1971. You need to consider that figure is an average over a long period and not the result for every single year. We believe gold deserves a place in a diversified portfolio, but you shouldn’t sell all your investments and only hold gold if you are nervous about the direction of the markets. gold has barely moved since the US market triggered the global sell-off on 2 February. Gold increased by 3% in value between the start of 2018 and 1 February, being the night before the US market slump kicked off events around the world. Investors were clearly getting a sense of impending problems, such as the signal from rising US Treasury yields which – as we reported on 25 January – reflected waning market faith in the Trump administration and expectations for further interest rate hikes. The two-year Treasury bond had started to yield more than the S&P 500 US stock market index which suggested in some quarters that investors may switch out of some equities. It’s interesting to note that gold has generally been in a rising trend since a few weeks after Donald Trump was elected US president. It is up nearly 17% since mid-December 2016. Gold has actually fallen by 2% in value since stock markets started to fall around the world at the start of February this year – essentially giving up some of 2018’s earlier gains, but in no way falling by the same amount as equity markets. For example, Hong Kong’s Hang Seng index is down 9.8% over the same period (running to 12 Feb, when this article was written). Japan’s Nikkei index is down 9%; and in the US, the Nasdaq 100 and S&P 500 are down by just over 7% in value. There are various ways to invest in gold. You can buy physical metal in coins or bullion form. You can invest in an exchange-traded fund which tracks the gold price such as Source Physical Gold P-ETC (SGLD). Or you can invest in a gold miner, although this is a higher risk way of playing the space as it comes with operational, financial, equity market and political risks. Diversified exposure to property as an asset class can be achieved by investing in listed property, construction and housebuilding firms including real estate investment trusts (REITs) and property funds. Due to issues of liquidity which can affect open-ended property funds during periods of turmoil, a property-focused investment trust may be more appealing as you can sell these types of shares on the open market if you want to get out. In contrast, open-ended funds can be temporarily frozen in time of strife such as periods when investors panic and rush to withdraw their money. In the case of property investment trusts, you still need to remember that a lot of people putting in sell orders in times of turmoil can depress the share price and potentially leave it trading at well below net asset value. Property is an investment that traditionally combines capital gains with income. Rental yields make it popular among those who invest for income, especially as REITs in particular turn this cash into generous dividends. REITs, which face extra regulation, enjoy a tax regime that almost replicates the situation you would face if holding property directly. The property market is driven by the scarcity of suitable properties and companies and funds are underpinned by owning tangible assets. On the other hand, this is a cyclical sector and its fortunes will wax and wane in line with wider economic fortunes. With most property purchases funded by debt the cost of servicing interest payments can also have a significant impact. Examples of property investment trusts on the market include F&C UK Real Estate Investments (FCRE) which yields 5%, trades at a 4.7% discount to net asset value and delivered a share price total return of 134.4% over the last 10 years. The market setback provides a timely reminder for investors to consider looking at capital preservation funds. These collectives have a good track record of helping investors avoid large losses and can grow your wealth too, albeit slowly. and they aren’t guaranteed to always make you money. However, their design is such that they should fall by less than the market in a downturn. For example, Capital Gearing Trust (CGT) has two objectives: to preserve shareholders’ real wealth and to achieve absolute total return over the medium to longer term. Its share price retreated by 1.9% in the week to 9 February 2018, less than half the decline of the FTSE 100.
deliver long-term capital growth through a multi-asset approach. And there is also Ruffer Investment Company (RICA) which invests in internationally-listed shares or bonds issued by corporates, supranationals or government organisations. Its aim is to maintain returns under a range of market conditions by allocating assets towards bonds, cash, gold and equities. Within the open-ended funds universe, Troy Asset Management, founded by Sebastian Lyon, is renowned for its distinctive method of investing that prioritises the avoidance of permanent capital losses through cautious asset allocation and the careful selection of high-quality companies. Have IPOs been hit by stock market volatility? Are there any investment trusts going cheap after the market sell-off? How will working part-time after retirement age affect your pension?